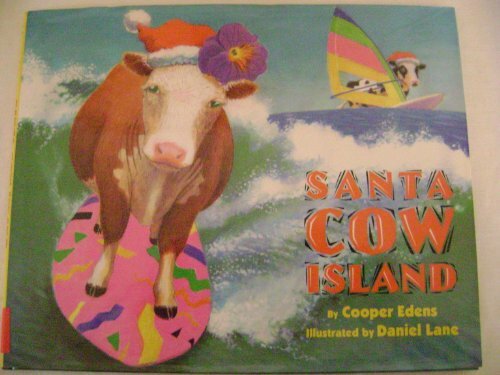 A whimsical take on The Night Before Christmas brings us cows instead of Santa, with wacky and delightful antics and surreal illustrations, while a family enjoys a South Sea Cow Adventure during their vacation on Santa Cow Island. COW-a-bunga! Surf's up with a vengeance in this welcome return of those enigmatic gift-giving bovines from Santa Cows. This book picks up where the first left off ("'Twas the day after Christmas"), with mom Schwartz hankering for "warmer climes." So the family sets off to Santa Cow Island, flying Cow-back by way of New York, St. Louis and San Francisco. Somewhere near Hawaii, they descend for surfing, tennis, snorkeling and "the ultimate thrill, outrigger canoeing,/ With Schwartzes and Cows bonding, chanting, and mooing." They swim with dolphins, golf, watch high-diving Cows and play beach volleyball-the fun enhanced by Lane's daffy, luminous watercolors. Fans of the earlier book-and others with a taste for quirky rhymes and sly references to pop culture-will greet this bizarre sequel with much jubilation. Distinctly aMOOsing. Ages 7-up.